The boot world is constantly buzzing with whatever the latest and greatest new technology or creation is. Whether it is something that is laceless, something that is incredibly light, something in garish colors, or just something that nobody had thought of before, the quick way to a boot’s success is to find a new path to dominance. However, while those items may get all the spotlight, there are still a few boots on the market that are making their mark through proven methods, but with slight modern twists to take the products to the next level. The newest version of the adidas Gloro is meant to continue the direct competition with Nike’s Premier, but also to try and bring the Gloro up to speed with the rest of the revolution. With the removal of the tongue immediately garnering backlash, there’s still no doubting that this boot is still built like a kangaroo leather classic. It might not have viewers immediately hearkening back to the days of everything dripping in leather with some slight modern additions, but the feel takes us back to something that has felt “oh so right” for decades: pure, leathery perfection. If nothing that’s hit the market in the last few months is your speed, perhaps it’s time to take a ride in comfort from the three stripes. Is it an immediate winner at any price? Or, is it a stone cold killer because it costs half of any other top-end boot on the market? This is the Gloro 16.1. The Gloro 16.1 is definitely a boot that toes the line between feeling like a heritage release and a modern leather creation. 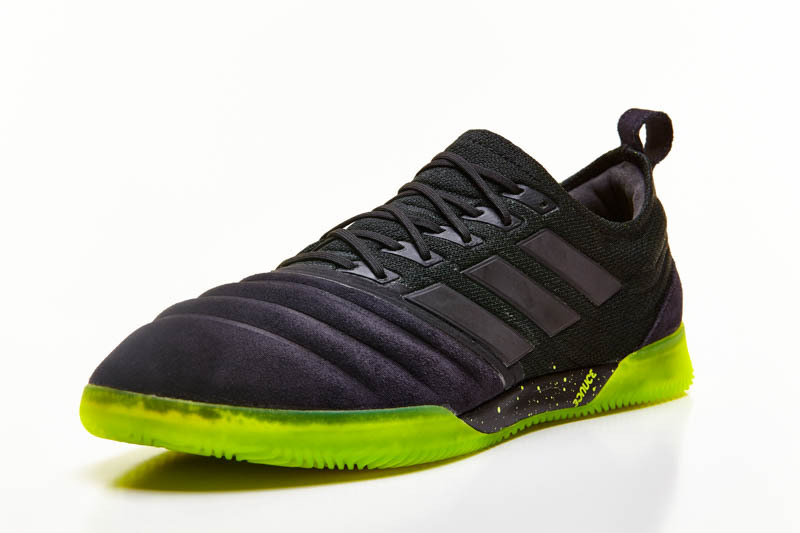 The upper has the look of something that could slip right in with the last few iterations of the 11Pro, but there aren’t any crazy colors that we saw adidas use with the 11Pro. The boot is very sleek, but there is a definite change to the look once the leather starts to soften up and some age starts to show. While there are a few other options, the two most prevalent choices of the new Gloro are a classy black boot with white stripes or a white boot with black stripes. Either way, it’s a class act for you to slip your feet into. Unlike other boots on the market, there’s not really a bunch of stitching to give the boot a signature look. There are the three stripes to send viewers straight to adidas, a “Gloro” callout on the heel, and an adidas logo on the top of the tongue. If you took away those logos, this boot could belong to anyone. A perfect leather concoction…and nothing to draw away from that perfection. The greatest thing about the Gloro 16.1 is that this boot provides the same touch and feel across the entirety of the boot. The leather’s thickness changes a bit from the forefoot to the sides of the boot, but it’s all of a similar quality. 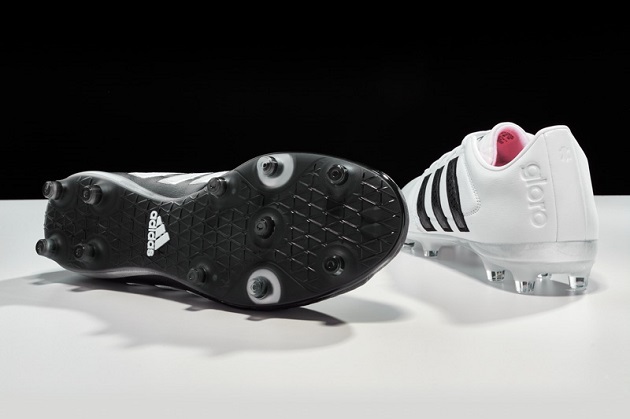 Adidas also made sure that the tongue has a similar level of padding so that everything feels uniform. It genuinely feels like adidas took great lengths to make this boot appealing to boot purists, but also to stand up to the incredibly high standards that leather boot fans tend to have. The first few times that you get the ball at your feet, you start to feel the nice, padded sensation that leather boots tend to bring. You get a great touch on the ball, and every bit of the boot is going to give a uniform feel on the ball. IF you’re looking for a barefoot feel, this boot is definitely not where you need your search to end. 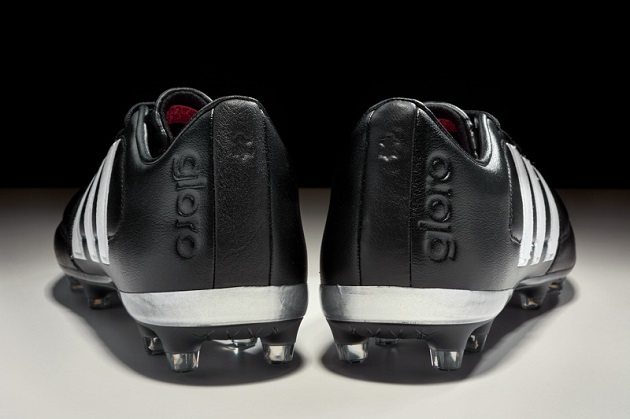 However, if a quality, uniform touch is your speed (hint: it’s everyone’s speed), then the Gloro definitely serves that up. Blasting through a shot or pass also gives you the feel that will make any player smile. The tongue has some nice padding to blend with the leather, and you get that fantastic warmth that a leather boot brings when you put your foot through a ball. Whether keeping the ball at your feet or launching it toward the back of the net, it doesn’t get much better than this. The soleplate on the Gloro is extremely basic, but it works. 11 conical studs on a set-up that has a nice flex once it is broken-in, but with a proper level of stiffness for a quality boot. If you absolutely must use an FG boot on artificial surfaces, this would be the type of stud layout that most people would suggest. For us, we really enjoyed it and never found ourselves really slipping and sliding. Overall, it helps round out a quality package and compliments the dependability of the Gloro. As with the last Gloro, this boot can be worn straight into action. However, as with most boots crafted predominantly from leather, the comfort only improves with each wear. After three or four sessions, the leather has absolutely melted on to your foot. The liner of the boot is a smooth synthetic that keeps the space between your foot and the leather down to a minimum, and the tongue is backed by a light suede material. All of this blends to give the type of comfort that any brand would be glad to have on their books. If the touch doesn’t draw you in, you’ll definitely stay for the comfort. This boot immediately joins our list of best value boots on the market. With our buddies over at SoccerPro listing these things at just under $100, there might not be a better deal on the planet! Durability to last you more than a season, enough kangaroo leather to satisfy any purist, and a boot that brings an impressive level to every category we look for in a boot. This is the perfect boot for anyone that’s just a recreational weekend warrior all the way to someone playing every single day. If the Gloro doesn’t suit you, then you must be putting your shoes on the wrong foot (who knows…they might still be comfortable…but, yeah…probably best to wear them on the right feet). Finding any professionals wearing a Gloro is a tough ask, although we’re sure that Jordon could probably still find us a few lingering on top-level pitches. 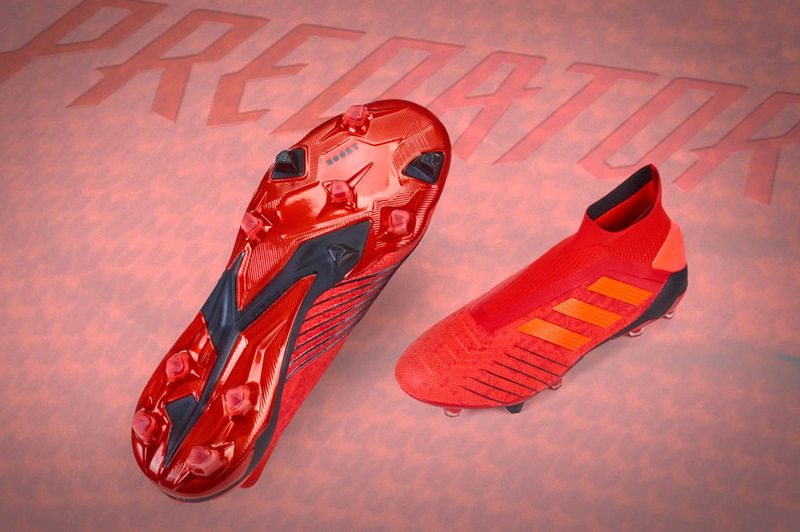 Still, don’t expect to tune into many major matches with the possibility of seeing these boots in action. Your best bet is a ref sporting them…or, just becoming the first high-profile person to wear them. 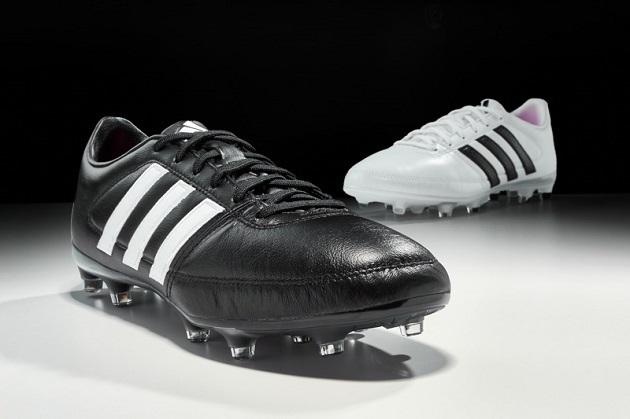 It’s fairly safe to say that there isn’t much competition to be the adidas face for the Gloro. If you aren’t looking to snag a great boot for nearly half the cost of most top-tier options on the market, then you’ll be fine without the Gloro. 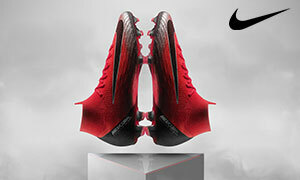 However, if the thought of snagging something that won’t break the bank while still giving the kind of touch that most players are constantly searching for IS for you…then this boot needs to be heading to your door immediately. It’s simplistic, but the quality is incredible. We kept the last Gloro in our gear bag for months after testing, and the new version might get the same treatment. It’s high time you got your own. Sizing: Much like the original Gloro, we found that this little beauty fits a bit closer to being a half size down (normally 10.5, wear a 10) instead of being perfectly true to size. 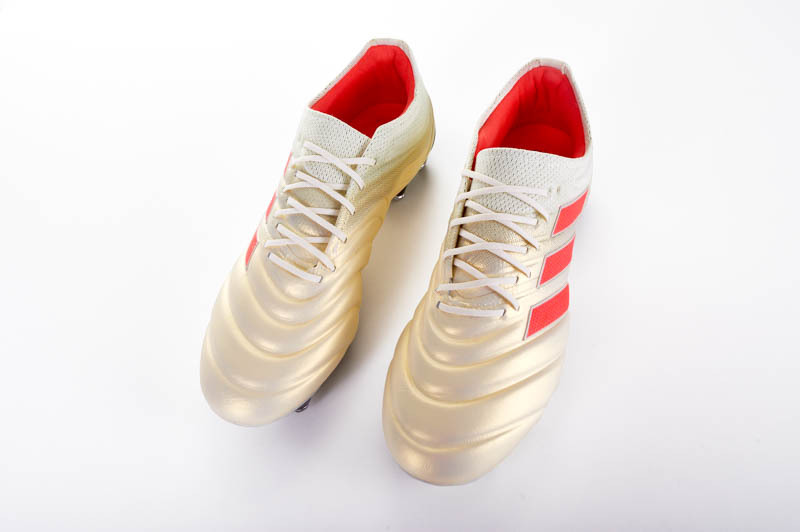 You can find the adidas Gloro at SoccerPro.com! 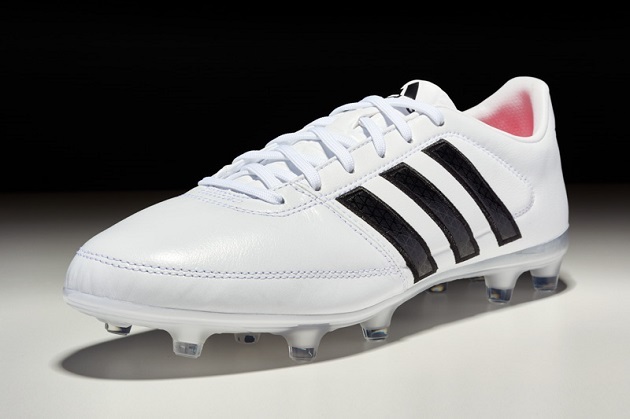 Would you use these shoes in the same size as the Copa Mundial? Perfect boots these, just got myself a pair and I cant be happier. Light and feels well on the feet. 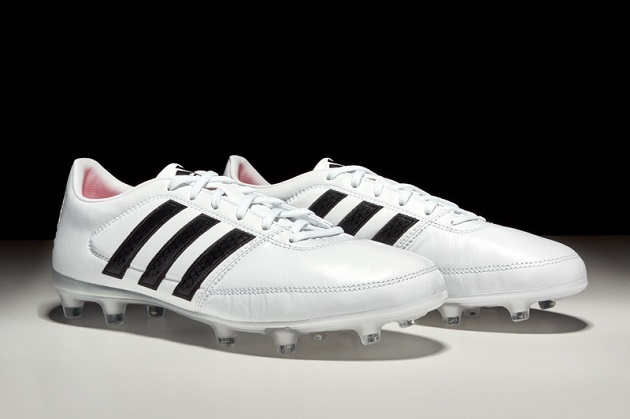 Have you owned Copa Mundials before? If so, what size difference is there between those and the gloro 16.1? I don’t know what size to go with and I don’t have a chance to try these on. Just got these boots. I can’t say enough about them. They are amazing! So soft and comfortable with just the right amount of paddding, and yet has an incredible feel for the ball right out of the box. These will probably be my boots of choice as long as they make them which I hope is years to come. I’ve never had a boot I have liked even close to these ones! I have tried about 20 different boots this week. I have very wide feet and need comfort over speed now that I am older (27). If you wear Copa Mundial or Nike Tiempo’s, I highly suggest you search for this boot. It is lighter, the studs are less noticeable, and most importantly, I found these more comfortable, specifically around the heel cup and arch area. I cannot say enough great things about these. I have been wearing the Ne Balance Visaro WIDE FIT and/or Copa Mundial and this Gloro blows it out of the water! 3 ounces lighter than the Muncial, more flexibility than the Visaro, These are the best. They have been out for a year now so If you are reading this, order yourself two because they do not make them anymore. I play mostly on AG surfaces and find moulds and blades give me too much traction. I bought a pair of Copa Mundials as they have a conical stud configuration and they feel fine on AG surfaces. The Gloros come in both FG and AG…The FG is considerably cheaper than the AG. Do they have the same studs & configuration as the mundials. Does anyone else use the FG’s on AG surface?